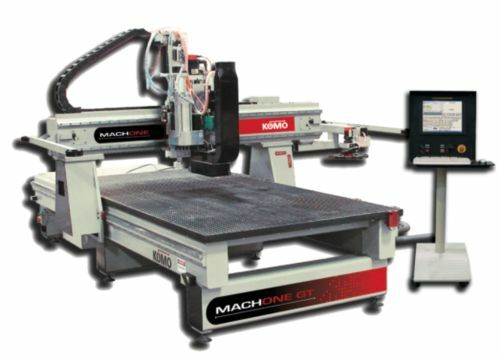 What does your CNC Router wish list look like? I am approaching my list from the point of convincing my boss he needs to upgrade our current basic CNC machine to something a bit more productive. Feel free to comment on my list, or post your own list, however you want – hobby machine or pro, doesn’t matter. My list would be best suited for a small to mid-sized cabinetry shop with an eye towards features that would maximize productivity and profitability. Servo motors – not steppers. Steppers are okay for non-production environments. Laguna uses steppers on larger machines cutting 4×8 sheets, but they are woefully inadequate and often stall in the middle of a job. Even the most basic servo will outperform the best stepper motor in this situation. Hardware controller – not software controller. The controller has to be able to be real-time. Software controllers like Mach 3 running in windows just have too many things going on to be reliable. Fanuc is one of the most popular and by many accounts the best controller on the market. Downside is cost. It is fairly expensive. 5×12 table instead of 4×8. For 99% of what we cut a 4×8 table is just fine. But, if you have limited space, hauling a 4×10 or 5×5 sheet (or even a 5×12 – yes that is a common size plywood) to the table saw is a massive PIA. Also, it allows you to fixture the back portion of the table for P2P operations without having to reconfigure the table every time. Multi-zone vacuum table. Being able to open and close vacuum zones on your table allows you to work in different areas of the table without excessive leakage that might compromise the holding ability. Moving Gantry instead of moving Table. This used to be a point of contention among the “experts”. Old school thinking says a moving gantry is not stable enough. The thing is, the footprint of the moving table is DOUBLE that of the moving gantry. For a small shop, that is precious space that can be used for something else. Plus, the technology has matured enough that, for woodworking, a moving gantry machine is more than adequate. ATC Automatic Tool Changer on the carousel. Some machines stow the tools at one end of the table. This slows the cycle times of the machine fairly significantly since the gantry has to move to the far end of the table every time. Having ANY tool changer is better than having NO tool changer, but a carousel on the gantry makes the tool change process quicker. Tool management on the console. I went a long time without this feature, but once I worked a machine that had it, (Biesse Rover), I wish they all had it. Being able to reference tools by name rather than by number gives last minute flexibility at the machine to adapt to broken bits and to quickly use an expanded bit library beyond the carousel capacity. This feature is awesome for VERY custom, but seldom used, operations. The machine keeps track of all the tools in your crib and also tracks which tools are currently in the carousel. Just tell the machine you are putting a certain tool in a certain slot number and it translates that to the g-code flawlessly. Line boring aggregate head. Sure, you can mount a drill bit in a tool holder and drill them one at a time. If you are drilling 5 at a time, it is 5 times faster, (duh). Not only does it free up a slot in your carousel, but, for the cost of the head, it pays for itself pretty quickly. And there is my list. Congrats for reading this far. When I think of the COST of a good Hobby CNC system would be (more than my current total Shop! ), I don’t even think about Dreaming about it… let alone developing a Wish List! You seem to have it all figured out so anything I would have to say would not be useful. My wish list is … well, blank. I don’t know a thing about them, and I don’t expect to ever want one. Your post sure makes it seem like you should be answering this for others, not asking it – lots of good research provided right there in your opening post. I agree with Jim! I’m sort of old school. I’ll stick with hand and power tools. Grid table, instead of waffle table, for custom fixtures. 20 tool, rather than 10 tool, carousel. Again, more spindles are better. We have 9, I’d like double that. 18-20 spindles. I don t know a thing about them, and I don t expect to ever want one. Others have their opinions and I asked to hear them. Hopefully this will become a discussion of what people are looking for in CNC Routers, and/or what value certain new features may, or may not, have for them. Again, more spindles are better. We have 9, I d like double that. 18-20 spindles. I get 9 spindles. That gives you 5 Horizontal and 5 Vertical (‘L’ configuration’). In our custom cabinets we only put 5 holes per adjustable shelf. Perhaps you drill the entire end panel with holes? Why else would you want so many drills? Help me understand – thanks. Do they make a 20 tool carousel? I think 4 bits do 99% of all our routing. (8 tool capacity machine) The other tools rotate into the open slots. Requested info from the mfg. Will keep y’all posted. I’ve requested a quote with my desired configuration. I am guessing in the $138k range plus or minus. Times may have changed the economics of things, though. Komo is a solid machine made in New Jersey in the good ol’ US of A. They come from the metalworking and plastics industries and deigned to make a few woodworking machines. I was at the St. Cloud factory about 18 years ago and they had a big “industrial grade” machine that was as big as a football field and several stories tall. The operator rode on the Z-axis plate in an air conditioned cab hanging on the vertically inclined gantry. They said it was for precision machining of large ocean vessel panels. OK, but can it make breakfast? Seriously, can it cut but parts of dovetails? 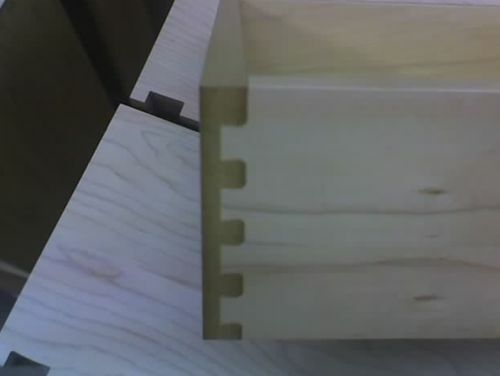 Well, yes, it CAN cut dovetails…sort of… if you count something like this as dovetails. It has a loader/unloader option AND it has a label printer aggregate head option that puts the part labels on the blank sheet first, then cuts them out. As for making breakfast, I haven’t seen a bacon and eggs aggregate head… yet. 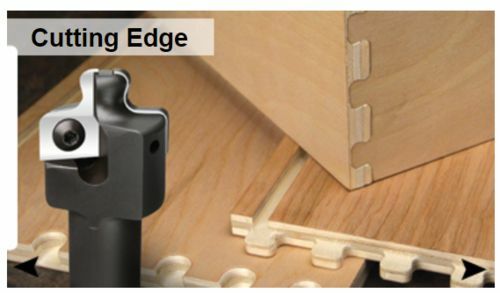 Nested “dovetails” are a little different, but the tails and pins are cut from the face, so a sheet of nested parts can be made into drawer boxes. The picture above shows some detail as to how they are made. It doesn’t quite do it for me, but, I suppose it has its place somewhere between rabbited particle board drawer boxes and actual dovetail drawers. You are paying about the same each month as you might pay to have a $12.75/hr shop lackey around and it is far more productive, optimizes materials about 20% better than your best guy and you only have to pay for the first five years. After that, it works practically for free. BTW, that 20% material savings goes straight to the bottom line. How much did you pay for sheet goods last year? Now subtract 20% of that! If you spent $100k on sheet goods, 20% is $20k per year. At five years you’ve saved $100k already, practically paying for the machine with that alone. When optimized on the nested CNC Router, for me, my waste factor on for non-grained melamine hovers around 4%. For wood-grained melamine it is around 10%. Most saw-cut sheet goods, in my experience, waste in the range of 20% to 30%. Of course, depending on many, many different factors, YMMV.